I thought I had missed them. A week ago, as I was hiking a local conservation area, I came across a patch of Indian Pipes, a very strange plant and a bit of a rarity around here. Alas, they were past their prime and already turning black. Not photo worthy. Earlier today, as I made a brief foray into a local forest, I was surprised to find numerous clusters of Indian Pipe still in great condition. I was even more surprised to find them in bloom. Honestly, I did not know they bloomed, as I have never seen them at this stage and in such fine condition. I made several images in the highly variable light of the pine forest and this was the best of the series. Generally, the heads of the Indian Pipe are nodding, thus the name: Monotropa, from Greek monos, meaning “one” and tropos, meaning “turn”. I was also surprised by the pink colouration, as these plants lack chlorophyll, which is what gives plants their green colour. These odd plants get their nutrients through a mycorrhizal relationship with a fungus, which in turn gets its nutrients for local trees. It’s this complex relationship that has led to the Indian Pipes lack of chlorophyll, they don’t need it. As I said, there were many clusters of this usually rare plant to be found, likely brought on by the warm, wet summer we have had. Usually, I have to look hard to find even a single plant, at the right time of year. Fortunately, I had my macro lense and tripod with me, so I was able to collect a nice sharp image, with good depth of field. This entry was posted in macro, Nature, Photography, Plants & Flowers and tagged forest, fungus, ontario, rare, strange on August 31, 2017 by Ed Lehming Photography. “Among the tales of sorrow and of ruin that came down to us from the darkness of those days there are yet some in which amid weeping there is joy and under the shadow of death light that endures. Over the past few days, I’ve been deliberately spending my lunches in the local forests, reconnecting with the wood and getting back to my love of photo-abstractions. Summer posses a unique challenge as bright greens dominate. Every now and then, a composition presents itself, as the light shifts continually, and an image emerges from the depths. In the same theme as my 2016 Autumn series titled “God Light“, these patches of sunlight, moving and shifting throughout the branches have a deep spiritual effect on me. It’s almost like I’m supposed to focus on that particular place for some meaning. Sitting with the images pulls me into the scene, realizing there is more at play than just the patch of light, there is a larger effect on the surrounding trees, as this light further reflects on the larger space. In this image, not only is the ground lit up, but a singular sapling, seemingly devoid of foliage is also caught in the light, becoming the focal point of the image, till the eye drifts past it and picks up the textures of the larger maples framing it. This entry was posted in Abstract, Landscape, Nature, Photography and tagged forest, God-light, light, ORTA, Walker Woods on August 31, 2017 by Ed Lehming Photography. This past weekend, I spent a few evenings with my son, who wanted to try his hand at night photography. So, I made a few shots of my own. Night photography is not my area of expertise and I spent quite a bit of time simply ‘experimenting’. I’ve also never used my D800, so was checking to see just how different the sensor was compared with my D300, with which I had become quite comfortable a few years ago. Conditions were not ideal, despite travelling to a “dark zone”, just east of our camper. Dark Zones are areas identified for their lack of light pollution and should be ideal places for astrophotography. I’ve included a map site if you are interested. On the evening that we travelled to nearby Fort Stewart, the moon was in an advanced waxing crescent, just high enough to light up the low clouds and obscure the fainter stars. Then, of course, the sky clouded up a bit and we had to wait for a few breaks. Add to that the plentiful mosquitoes, brought on by our wet summer, and that was the recipe we had to work with. In the end, I ended up with a few interesting images, including this one of the Big Dipper, just above a line of trees, with the moonlight reflecting off the clouds. I have yet to see my son’s images. I’m hoping he was successful in what he hoped to capture. This entry was posted in Landscape, Nature, Photography and tagged Big Dipper, constellations, darkness, night, stars on August 31, 2017 by Ed Lehming Photography. I came across this mystery mushroom a few days ago, while hiking during our recent partial eclipse. I’m unsure of the species, but the red cap and ivory stem would indicate it to be a member of the Amanita family of mushrooms. The shape of the cap is not typical of this species though, so I’m stumped. The image quality is not my best, as it was hastily made while trying to avoid the hoards of mosquitoes which were particularly active that day and were particularly voracious, despite my insect repellent, which is usually very effective. Despite the obstacles, at least I have an image I can review and figure out what this is called. This entry was posted in macro, Nature, Photography and tagged mushroom, red, Secord Forest, unknown on August 29, 2017 by Ed Lehming Photography. I spent Saturday evening with my son, on the dock at the camper near Bancroft, Ontario. Conditions were not ideal, as there was a fine have in the sky and the waxing crescent moon had just set, but we took the opportunity to make a few images despite these conditions. The results, while not quite what I was after, are pleasing and capture the mood from the dock nicely, including traffic on Highway 62, which runs along the west end of the lake, creating the light streak to the lower right of the photo. This entry was posted in Landscape, Nature, Photography, Travel and tagged Bancroft, Marble Lake, Milky Way, night, stars on August 28, 2017 by Ed Lehming Photography. 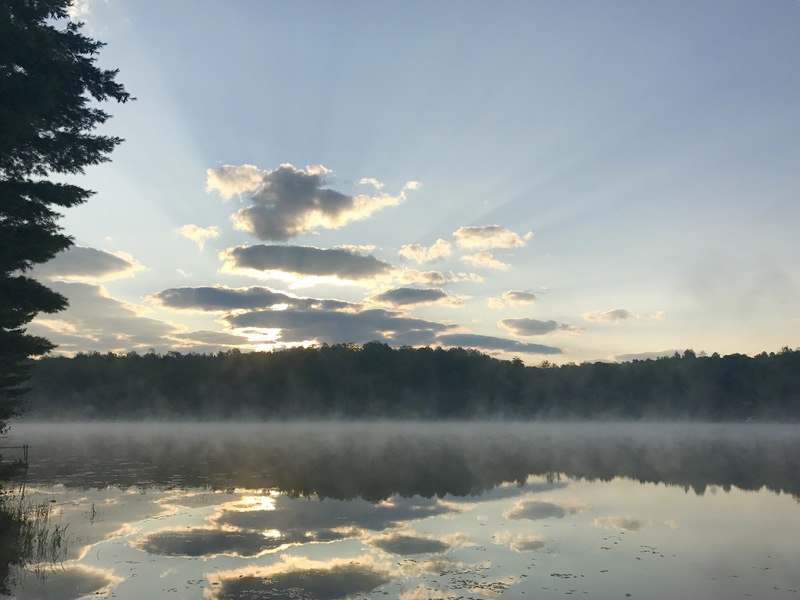 A beautiful, cool dawn on Bancroft’s Marble Lake. The mist swirls gently on the water’s surface, as the sun rises behind a low ridge. A pattern repeated throughout the summer, each time, slightly different. In the distance, Blue Jays screech high in the trees and the world awakens as the sunlight reaches further every minute. A new day begins. This entry was posted in Photography and tagged Bancroft, light, ontario, summer, sunrise on August 27, 2017 by Ed Lehming Photography. Quite often, I come across scenes that make me pause, because they are unusual or momentary. For me, those scenes are a break from the mundane, everyday scenes, and I relish them. Like this image of two Black Blister Beetles (Epicauta pennsylvanica), feasting on recently blooming Goldenrod. I also had to look the beetles up, since I was not sure what they were. To my surprise, most images of the beetles have them feeding on Goldenrod. So perhaps, this is not so unusual after all? In my many hours hiking local trails I have not noticed these beetles, which on this particular day seemed to be infesting most of the Goldenrod along the trails. It may have been a unique event for this day, or I may simply have missed seeing it in the past. What made this scene more interesting to me was that all the beetles; there where more than just these two, were all facing the same direction. It’s just the close proximity of these two that made me come up with the title. I did go back out the next day and the beetles were gone. This entry was posted in macro, Nature, Photography, Wildlife and tagged beetles, goldenrod, Unusual, yellow on August 25, 2017 by Ed Lehming Photography.